← Monday Question – Special Edition: What Would You Like To Ask Linda Pilkington? I, for one, have been impatiently waiting for Un Jardin sur le Toit to be released, since I am a declared Ellena fan and I love two of the three previous scents in the series and am intrigued and challenged by the third. Last Friday the Hermes boutiques launched Un Jardin sur le Toit – a garden on the rooftop, so I braved the haughty SA’s at the Vienna boutique and was pleasantly surprised at their friendliness this time. Maybe this fragrance had something to do with it, also Baby N. did his very best to charm them. In contrast to the exotic locales of the first three perfumes in the Jardins series, the fourth and newest perfume by Jean-Claude Ellena explores home turf, a garden on a roof in Paris. 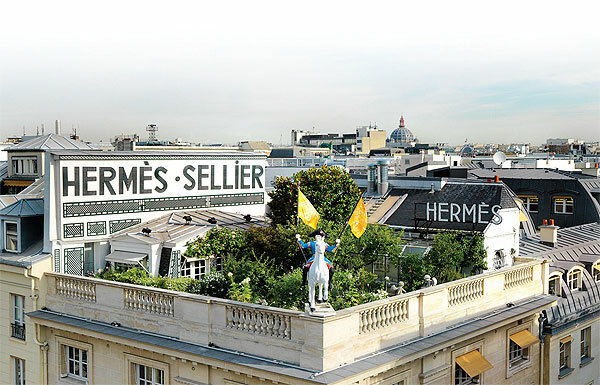 Not any rooftop garden, but that of Hermes headquarters itself, at 24 Rue du Faubourg Saint-Honoré. While the first Jardin perfume centered around the Mediterranean fig, the second around Egyptian mango and the third focused on melon from India, Jardin sur le Toit showcases a fruit very near and dear to our hearts and noses – the apple. Notes include apple, pear, rose, green grass, basil, magnolia and compost notes. Jardin sur le Toit opens with a sparkling and wonderfully bright and many faceted accord of apple, pear, grass and citrus notes. It is one of those scents you cannot very well say no to, the top notes are so inviting and so fresh and prickly, they make you smile involuntarily and make picking up a bottle a breeze. For a second the perfume teeters on the brink of Pomme d’Api* territory, before it segues into a wonderfully complex, but always sheer composition of green, fruity and floral notes. *Pomme d’Api is a children’s shampoo by Yves Rocher that accompanied me through my childhood, it has an intense green apple note. In its heart, Un Jardin sur le Toit is still very green, the grass, even a little earth and herbs (I smell basil) are clearly there, but I was surprised by how floral it is. Rose and Magnolia make a lovely pink bouquet that balances the green apple nicely, as to not let it take over the fragrance. Un Jardin sur le Toit lasts a long time for an Eau de Toilette, this is no gone-in-an-hour-summer scent, but it stays – always light, quiet and reserved, mind you – but present and distinctive for at least six hours on me. Decidedly longer than the other three in any case, although their longevity is not so bad either. Un Jardin sur le Toit is surprising at first, but when you think about it, it is a perfect and quite literal interpretation of a locale, as were the others. A garden in a city, in a city like Paris, there is the undeniable coming together of two worlds. 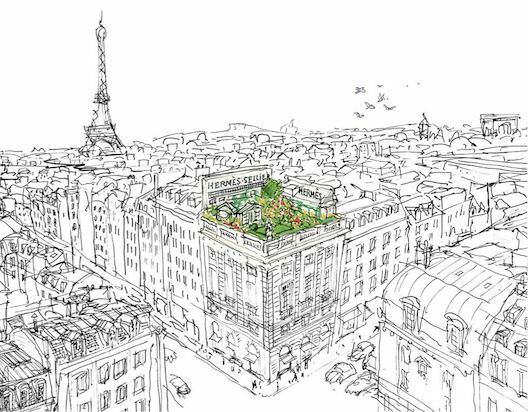 Un Jardin sur le Toit manages to masterfully unite nature and urban environment, thus depicting what it says it would, what the beautiful artwork on the packaging shows – a garden on a rooftop. That is a place where I would love to stay. As long as Paris is that far away, a bottle of Un Jardin sur le Toit does just fine in getting me there in an instant. All it takes is to close my eyes. 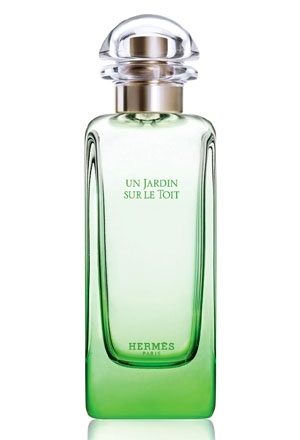 If you would like to try Un Jardin sur le Toit yourself, I have a sample vial to give away, courtesy of the nice Ladies at the Vienna Hermes Boutique. GIVEAWAY CLOSED! To participate just leave a comment telling me what your favorite Jean-Claude Ellena creation is. The draw closes on Friday, April 8 midnight GMT. International entries welcome. This entry was posted in Citrus, Floral, Fragrance Reviews, Fruity, Green, Hermès and tagged Fragrance, Hermes, Jardins, Jean-Claude Ellena, Paris, Perfume, Review, Un Jardin sur le Toit. Bookmark the permalink. I was really looking forward to this review and am *very* glad it turns out to be a nice addition to the Jardin-range! To me the most important part is that they evoke that careless summery feeling and it seems this one does the job again. Not completely sure how the apple will work out but it sounds like it’s worth a try for sure. It certainly evokes a carefree, summery feeling, but it does more than that, which is what I love and appreciate. Definitely worth a try, even my hard-to-please husband loves it! You are included in the draw of course, good luck Guus! And there is absolutely no doubt what’s my favorite Ellen : Cologne Bigarade Concentree (Frederic Malle). A the moment closely followed by J. en Mideterranee. Ah, Bigarade Concentrée, I love that one too! 😀 N. would be delighted to be of help! Oh yes, I would definitely like to participate. You had me with herbs, basil and grass. 🙂 It sounds perfect for spring. OK, my favorite Ellenas are L’Eau d’Ambre, Elixir de Merveilles and Angeliques sous la Pluie. I couldn’t really decide which of them would I name as the one. You are right is really hard to pick just one, those three are all excellent. Gasp. you make this sound like a must try. I think the only apple I liked in a fragrance was the earthy apple tea in Traversee du Bosphore, so am very curious about how it turned out in this fragrance. please enter me in the draw! As for my favorite Elena, I don’t think anything will beat Jardin Sur le Nil- it just has a soft spot in my heart, and while there are days when the journey through the notes are a bit wonky, I always love the drydown. L’eau d’hiver is nice too. I have never smelled an apple liked in a perfume before either (TdB was not for me), but with this I am happy. Nil is indeed lovely, also I should wear L’Hiver more often…good luck in the draw, RH! Want, want, want! I just ran out of my bottle of Jardin sur le Nil, and my Mediterranee ran out long ago. I may have to find a bottle of this one, now. I think JC Ellena is nearly the only one I would trust with apple, after being scarred by DKNY! I would never consider apple, truth be told, of it weren’t an Ellena perfume, I (snobbily) would never have tried it, just based on the notes. So glad I did though! Let me know how you like Toit! I’ve been eagerly awaiting this review. Un Jardin Sur le Toit sounds really good, although I am usually wary of apple notes–aren’t they all synthetic…? That garden looks so inviting! Do they let patrons go up there? My favorite Ellena creation, to date: Un Jardin sur le Nil. I think that there are apple notes of varying syntheticity (is that a word? ), and this one happens to be very natural and lovely as well as well balanced with other notes, that is why I really enjoy it in a fragrance for the first time. Now we know the antidote to snooty SAs – take a baby as cute as N! So glad this one did not disappoint you. I definitely need to spend some time with the Jardins as I only tried Jardin sur le Nil in the very early days of my perfume obsession and didn’t really appreciate it and never tried the others. No need to enter me in the draw, thanks. The great thing about the Jardins is that they are so wearable, which also makes it easy to dismiss them, but they are way more complex and brilliantly executed than they might seem at first. I love JCE, so I have really been looking forward to trying this one. So hard to choose a favorite… top 3 faves are eau de merveilles, kelly caleche, and osmanthe yunnan. I really enjoy the Jardin collection, so I am glad to read a review. It sounds lovely! My absolute favorite JC Ellena creation is Vetiver Tonka. I love the way he made vetiver gourmand. Lately though I have been using a lot of Jardin en Mediterranee and Elixir des Merveilles, and Bulgari au The Vert is always a favorite in hot weather. Thanks for the drawing! I’m afraid of braving the local Hermes boutique. Good luck in the draw, Kathy! It is too bad so many desiger boutiques have such a forbidding atmosphere, do they want customers or not? Apples, grass, herbs and a very light floral bouquet, done by Ellena no less…this does indeed sound very good! Please include me in the draw. My favorite Ellena scent, well, there’s two of them: Bigarade Concentree and Angeliques Sous la Pluie. Good luck to you, Suz! I am glad you like L’Eau d’Hiver, it is a curious perfume, I aleays forget what it smells like, which is a bad sign normally, but I always fall right back in love when I smell it again. But somehow it refuses to stay in my memory. An amnesia inducing perfume! LOL, that is curious! Last night as I was falling asleep, I kept getting wafts of Eau Premiere—so much so that this morning I asked M if he wore it to bed last night, but he hadn’t—it was d’Hiver! How weird is that? Mmm – apples and grass sounds wonderful! So glad this one made the grade. Thank you for this thoughtful review. My favourite Ellena remains Sur le Nil…one of those scents that made me say “Ooo!” aloud. I am curious what others will say about Toit, when it gets into wider distribution. Thank you for a fantastic review AND a giveaway! Yes, I’d like to participate, even though I did not have a whole lot of luck with apple and basil scares me pretty badly. My favorite Ellena creation is the original First by van Cleff and Arpels. I haven’t tried that many though. Ambre Narguile needs an honorable mention as well, I like it a lot. Hi, would love to have the sample, I own two of the Jardins: Mediterraneé and Mousson and love them but somehow I always found Nile too sharp for my taste, I can appreciate it but did not buy it. My favourite Ellena creations are two: Kelly Caleche and Declaration. Thank you! You are in the draw of course, good luck to you! That is a tough question, I do love many JCE scents. Osmanthe Yunnan, Jardin en Med, and Jardin sur le Nil are probably at the top of the list. I was intimidated for the longest time about going into our local Hermes boutique, but am so glad I finally did! The SA’s were friendly, let me sniff, gave me 2 or 3 huge samples each time and even a lovely mini of Voyage since they didn’t have any samples of that one. I think everyone is a little more relaxed in California, even Hermes SA’s! Osmanthe Yunnan tops my JCE list too! You are in the draw! First, because it was my mother’s ‘final’ perfume, it is glorious in itself and because she loved it so much, both her daughters said goodbye with a bottle. To this day, we can both close our eyes and remember her in a heartbeat, wafting First. Your three favorites present such a great journey through Ellena’s career. I hope you get lucky in the draw! Wonderfully informative and careful review, thanks, and congratulations on getting out a review so quickly! This is the first I have seen. Toit sounds perfect, although I’m so glad you said it avoids Be Delicious territory. Is it planned as the last of the ‘Jardin’ series? It sounds like a return home, a full stop. I’d love to be in the draw, but you know I’m in Australia so if that is an issue, do leave me out. Mediterranee is my favourity JCE (so far, have not tried many). Nil is in its way to me, and I hope it gets here before our run of gorgeous autumn weather finally closes into winter. Thank you! I power-tested this over three days to be quick with a review, since I had the good fortune to find it so early after its launch. I hope you are not right with your idea that this is the last of the series, but you very well might be true, the return on home turf, what can follow that? Nice review, thank you Olfactoria. My favorite Ellena’s perfume is Terre d’Hermès. Do not enter me into the draw, I think I’ll have a chance to test it when it arrives to one of the fancier stores around without sacrificing a first born child, so let’s leave more chances to those who aren’t as lucky in terms of SAs. Good luck then, maybe you get to know a second, Marie! what a lovely review. My fav JCE creation is Gentiane Blanche. I just recently tried this, it is lovely and unusual. Good luck in the draw, Si! So far, my favorite fragrance would be Osmanthe Yunnan. I do wish taht it lasted longer on me, but I love it anyway. I do hope that I am able to smell this scent soon. I really enjoy your blog, and thanks for the giveaway. I am glad you like my blog, thank you for commenting! Osmanthe Yunnan is really special, I wish it had a bit more lasting power too. You are entered in the draw, good luck! Kelly Caleche is similar for me, it seems to fit so many moods and occasions. Thank you, I’d love to try the new Hermès Jardin fragrance! Please enter me in your draw. My favorite Jean-Claude Ellena fragrance is Un Jardin Après La Mousson because it is so refreshing in hot, humid weather. I also enjoy wearing Eau Claire des Merveilles, Kelly Caleche, Osmanthe Yunnan, and Eau Parfumée au Thé Vert. It is hard to pin it down to just one with Ellena, if one likes his style, isn’t it? Good luck in the draw! Favorites are Au The Verte and Kelly Caleche. I’m excited to try this new Jardin. Thanks for the draw! I have yet to try this one, I will. I was anticipating it for summer. Hmm…when you mentioned apple, I immediately thought of DKNY Be Delicious, probably my most hated fragrance that I have sniffed to date. (Sorry, I know people like it but it irritates me). But, I do like apple and I wouldn’t mind something with notes of baby shampoo! (Bio-clock ticking, yes, but I’d rather smell like a baby than have one). It’s the “compost” note that is scaring me as I read the notes in Sur Le Toit. Oh, my favorite J-C Ellena fragrance, how cruel of you 😉 If I had to narrow it down, I’d go with Sisley Eau de Campagne. That’s one of my favorite summer perfumes. I love Nil and Mousson (I cannot say which one I favor – it depends on my mood) – would LOVE to try this one! Thanks B! Interesting, I didn’t know this was by Ellena, thank you.